I was thinking about putting all of November's Unplug and Read books all in one post, but I decided against it because I thought that each book deserved its own review. (In case you missed what I planned to read this month, journey over to this post!) I wasn't able to read the Uglies because of time constraints, but I bought it so I can come back to it in the future. Although I abandoned this book the first time I read it, I'm glad I decided to pick it up again. 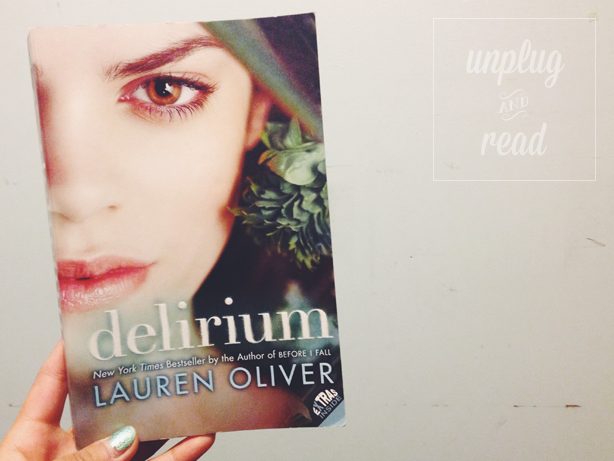 Love as a disease is a strange concept, but Lauren Oliver did a pretty good job providing solid examples (i.e. death due to love in Romeo and Juliet.) I really enjoyed playing this book like a movie in my mind, especially the thrilling and heart-pounding parts. I have to give this book three (and a half) stars for the interesting storyline and ability to keep me flipping onto the next page, even when I was tired. It didn't reach the status of AWESOME because it took a while for the story to actually start, I think it would've made a really good TV show though. (It was supposed to be one, but FOX cancelled it!) Read this if you're looking for a twisted love story! Which book would you like to hear about next — Allegiant or The Maze Runner? Tweet me at @amarisafloria to let me know!